Have you discovered Jojoba Oil yet? It looks like it should be "joe-joe-ba," but it's pronounced, "ho-ho-ba." And, though it says it's an oil, it's really a wax ester. Processed from a plant, it's so like our own skin's sebum that our bodies can't tell the difference. 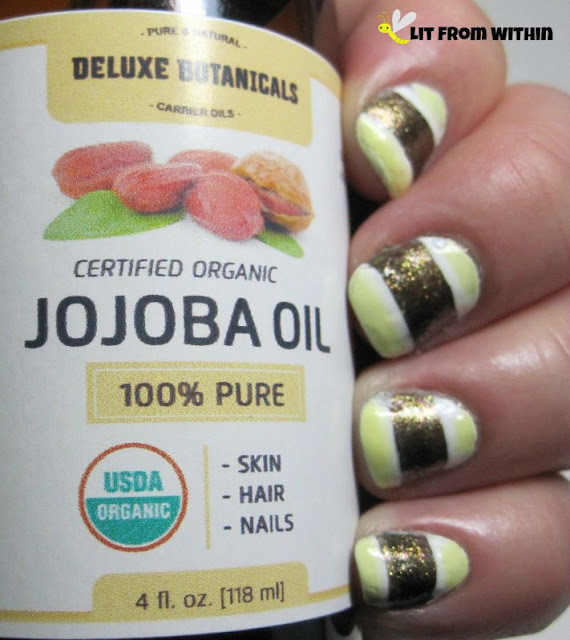 My favorite use for Jojoba oil is for my nails. I either use it straight up, or mix into a blend of oils that I keep at my nail table to use after I've dried my skin out with acetone. I love working it up into the cuticle, and under my nails, as well as my hands. It takes a few minutes to fully absorb, but it's so worth it. If you have really curled nails, keeping them oiled can help straighten them out. Brittle nails can be improved by keeping them oiled. I really think that saturating my nails with oils helps me to not have such a hard time removing glitter from my nails. I also like to put some oil on the ends of my hair to keep them from frizzing. While Argan oil is my preferred oil for my hair because it's heavier, those who find Argan to be too heavy may like Jojoba instead. 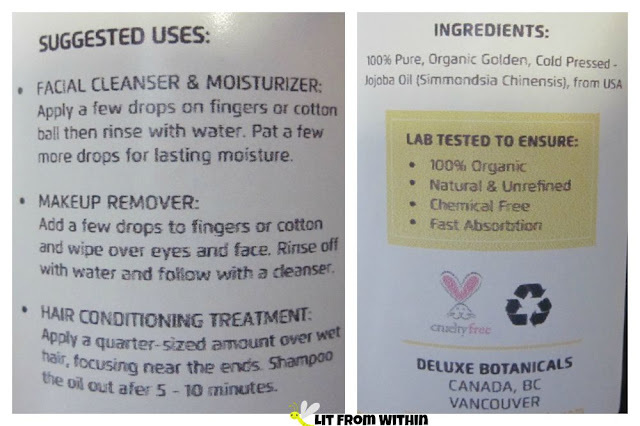 I also used it to remove some makeup that I had swatched on my hand, and had set so strongly that soap and water didn't remove it. Came right off with just a little drop of Jojoba Oil - no scrubbing needed! 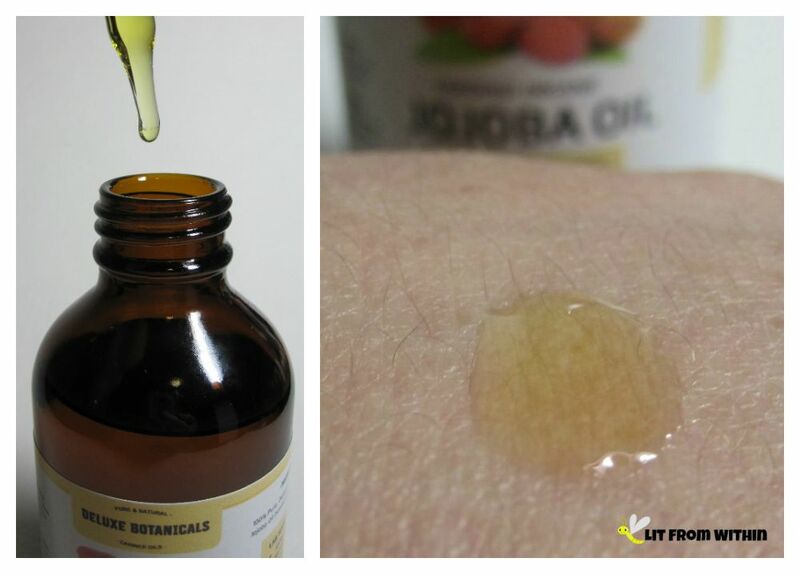 Deluxe Botanicals Jojoba Oil is certified organic, 100% pure, cold-pressed from plants grown in the USA. It has a slightly nutty smell and a golden color. With nothing added and nothing removed from the oil, it has lots of skin- and hair-loving nutrients, such as Vitamin E, B-Complex, Copper, Zinc, Selenium, Iodine, and Chromium. Because it's almost identical to our body's natural oils, those with sensitive skin can usually use Jojoba Oil without side effects. I've created a little striped nail art using a white striper, Deborah Lippmann Chain Reaction, and Glitter Gal Wattle Breath. A little nutty! For more information, or to purchase, you can find Deluxe Botanicals Jojoba Oil on Amazon, where it currently retails for $12.97. They offer a 100% money-back guarantee if you're not completely satisfied! Wow'ed by Wu for Lancome? It's Caturday! Er, Wednesdecat! Wekittenday? A Whiter Smile with Smile Brilliant!